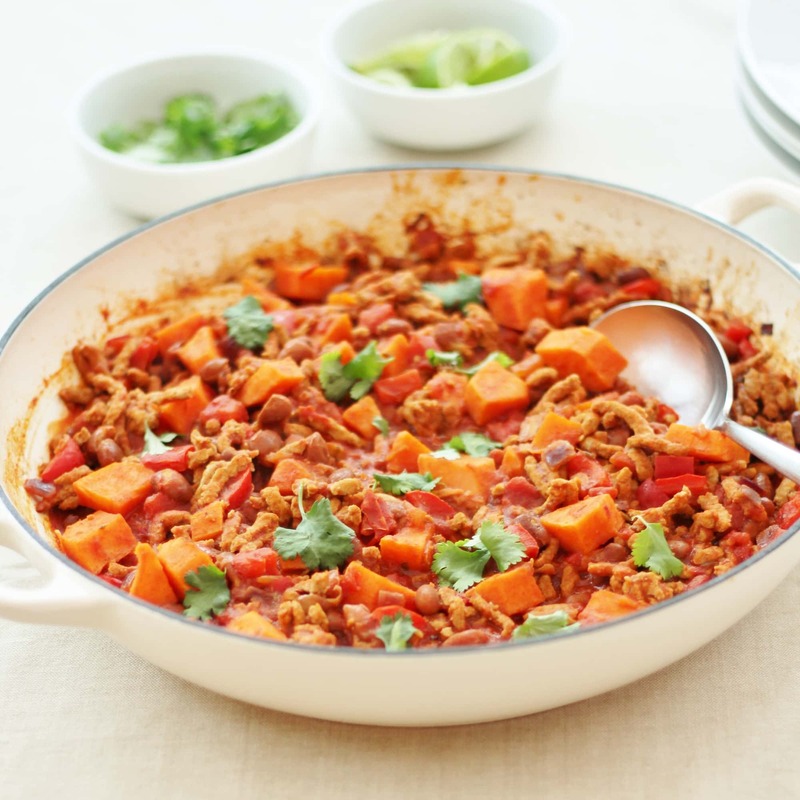 A quick and tasty twist on the Tex-Mex classic, this Pork and Sweet Potato Chilli con Carne is perfect for busy weeknights, filling the freezer or a lazy weekend lunch. 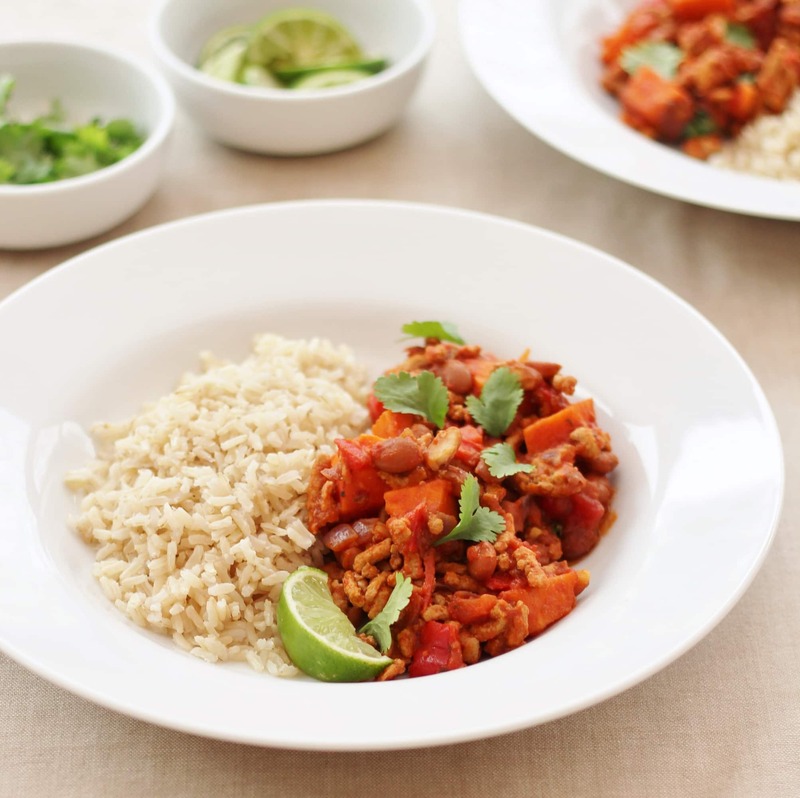 Mmm – who doesn’t love a good chilli con carne? I am a huge fan – so much so that I think I have about 12 different versions on my blog! – everything from Slow Cooked Beef and Pumpkin Chilli to Quorn Chilli, Slow Cooked Chunky Chilli to Chicken Chilli Con Carne. But for some reason I have never shared my Pork and Sweet Potato Chilli Con Carne. This is such a fabulously easy and quick to make version and one of my go to midweek staples….the sort of recipe I know off the top of my head and keep most of the ingredients in my cupboards/fridge so all I need to do is buy some pork mince and there is a nice dinner on the table in under 30 minutes! 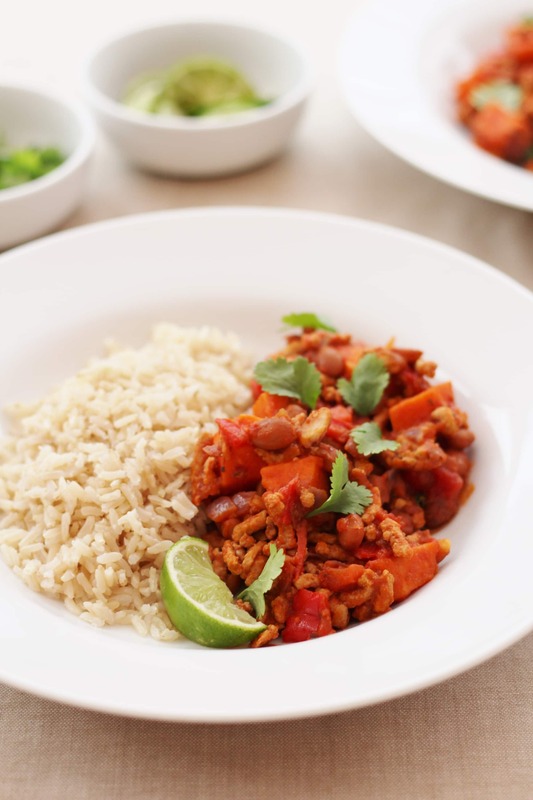 This Pork and Sweet Potato Chilli Con Carne is also a total crowd pleaser – my kids seem to prefer this one to the more usual beef version and I am inclined to agree with them – pork mince has a softer texture compared to beef and I think goes even better with flavours like cumin, paprika, oregano and chilli. As you know, I like to keep my meals as healthy as possible – here I have added onions, sweet potatoes, red peppers and pinto beans to this chilli con carne to help get up to that all important 5 a day – serve with a large dollop of homemade guacamole and that’s practically your 5 a day in one meal, without even trying very hard! I’ve used pinto beans here, because I really like them and think they just work brilliantly with the other flavours in this recipe, but kidney beans, black beans or black eyed peas would all work well here too – go with whichever you prefer. And for a veggie version I would replace the pork mince with a couple of tins of different beans – I often make a veggie version of this chilli and it is fab too! And very economical if the pennies are tight!! To serve you can keep this really simple and healthy, and just have it with some brown rice, as I have shown here, or you can pull out all the stops and have this with tortilla wraps or tacos, guacamole, salsa, sour cream, cheese…and whatever else you love with Tex-Mex food! I would choose a Sauvignon Blanc to pair with this, or if you prefer red, a Chilean Merlot would also be a good choice. A Mexican beer, such as Sol or Corona, would work well too. 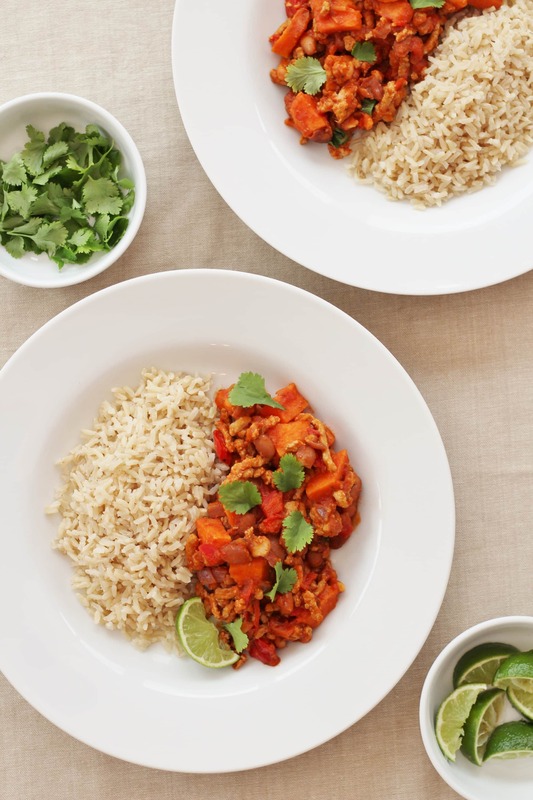 A quick and tasty twist on the Tex-Mex classic, this Pork & Sweet Potato Chilli Con Carne is perfect for busy weeknights, filling the freezer or a lazy weekend lunch. ½ teaspoon chilli flakes or more if you like it hot! Guacamole, salsa, sour cream etc. Put the olive oil, red onion and red pepper in a large, wide saucepan. Put a lid on and gently cook for 3 minutes on a low heat, stirring occasionally, until the onions and peppers have softened. Remove the lid and turn the heat up, add the pork mince and cook for 3 more minutes, stirring frequently and gently breaking up the pork mince. Add the chilli, cumin, paprika, oregano and garlic, and cook for 2 more minutes. Add the tin of tomatoes plus the tin of pinto beans (including the water), the sweet potato and some salt and pepper and bring to the boil, then turn down the heat and simmer uncovered for 20 minutes, stirring occasionally. After 20 minutes, turn off the heat and then add the juice of one of the limes and 1 tablespoonful of chopped coriander and stir. Cut the other lime into 4 wedges. Scatter the chilli con carne with more coriander and serve with the brown rice, lime wedges and guacamole/salsa/sour cream/etc. Stunningly beautiful images and recipe as always!